The biggest regret of our marriage: our cat. And, yet, we love her and can’t imagine our life without her and could never, ever in a million years get rid of her. Seems like a contradiction, but I think all pet owners can understand how such feelings coexist. Johnny and I are animal people. We are at the complete mercy of those lovable, furry faces, and kittens especially have the ability to throw all our rational thinking out the window and into the dumpster. Keep kitties away from me, I tell you, or I will take them all for my own! And so it was that two weeks after moving to New York City, I found myself at a shelter a few blocks from our apartment ogling all the available kittens. I’d wanted one for a while, and Johnny had, too, but he likes to pretend he’s not a major softie. But he totally is. The timing just hadn’t seemed right yet. We had been in school, not making much money, and our landlords hadn’t allowed animals. But now we were in New York, out of school, and both working full time. And our landlord had agreed to let me have a cat despite the no-pet policy. Sometimes when I really want something, I can be somewhat charming and convincing. After seeing all those kittens at the shelter, we were both goners. So we picked out the scrawniest one and brought her home with us. After 24 hours of refusing any of the five kinds of canned food I’d bought her, our new cat finally decided on a flavor she found edible. Thus, the name Persnickety was chosen — Persie for short. And, thus, also began a new set of expenses. I wanted to slice these expenses in half by training her to use the toilet, but Johnny nixed that idea immediately saying it would make us too weird. I buy our food and litter in large quantities, so I really only need to buy it once every couple months, but it averages to be about $30/month. We bought quite a few toys in the beginning, and then we found out that Persie’s favorite toys were yarn and candy wrappers. Go figure. We quickly learned that our cat likes to scratch anything and everything that will get her attention. She stares us right in the eyes as she defiantly scratches as hard and fast as possible on our couch until we are within reach of her. These are the moments we regret our decision to get a cat. So we use Soft Paws on her, which are plastic caps that stay on her nails so that she can’t damage our belongings. And lint rollers are self-explanatory — fur, lots of it. This money is mostly used for emergencies, like that time I stepped on her and thought I broke her paw. Persie limped around with one front paw in the air at all times, and just the sight of her could bring Johnny or me to tears. So off to the vet we went, and $125 later we found out she was just a dramatic kitty with no broken limbs. If we’re just spending a weekend away from home, Persie is okay on her own with extra food and water. But for our legit vacations, our friends will check in on her each day. In return, we give them a gift card to a restaurant, movie theater, or favorite store when we return home. One of the downsides to renting is pet deposit fees. In the three locations we’ve rented from since adopting Persie, only one place has required one (nonrefundable!). And it was a whopping $500! Ugh. But, we can’t live without her at this point, so we dished out the cash. So, to pet or not to pet? Is the financial cost worth the emotional reward? For us, the answer is yes, but at the same time, you won’t find us getting a second pet anytime soon. I want to print this out and give this to my kids, who keep asking for a cat. Except they don’t read. Shoot. Can you turn this into a vlog? ohhh man. I totally relate. We have a cat who we ADORE but in the first 18mos of us owning her we paid THOUSANDS of dollars to have her diagnosed with IBD (irritable bowel in cats). She’s now on a low protein diet and has, what I have diagnosed as ‘Feline Diva Bulimia’ basically if I don’t rotate the flavor of her food every 2-3times she will eat it all then proceed to immediately throw it up in protest. I’ve caught on to her ways though…. Look at that face! 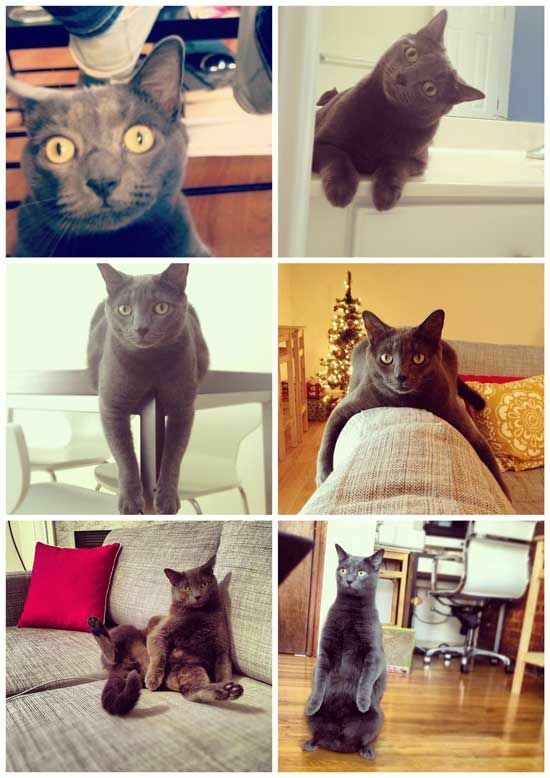 I’m a sucker for a gray kitty and I love a good sitting cat (it thinks it’s people!). My boyfriend and I are both total animal people, and I’m a major cat lady. 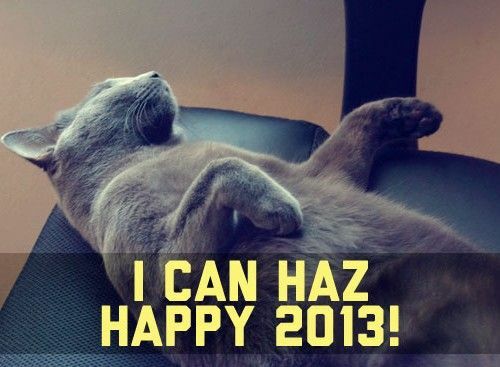 I got really lucky with my cat, though, she’s not destructive or unhealthy. I’m her 3rd (and final!) owner, so she’s a pretty laid-back creature. My roommate’s cat is such a terror that I actually brought my cat to live at my boyfriend’s house to keep her away from both the rambunctiousness of the other cat AND the blame from things getting broken in the house. That said, as much as we fall in love with the kittens at Petsmart EVERY. TIME., we won’t be getting another pet until we have our own place. And it might be a dog. I don’t know if we’re responsible enough for that yet. Haha, it thinks it’s people for sure! Your cat sounds like a dream. I keep telling myself to just give it a few years for ours to calm down. And don’t get me started on getting a dog… when we’re no longer renting, that’s a definite on the must-have list! We were gifted our dog about two months after we got married. He is absolutely our fur child and can’t imagine life without him. Especially because my husband works 24 hour shifts, so even when I’m alone, I don’t really feel alone because my baby is there. He is expensive though, and we’ve spent a pretty penny on emergency vet visits in the past few years–but never once have we thought of getting rid of him or thought he wasn’t worth it. In fact, even we were on one income and SUPER poor, we still got him the organic best dog food, while we eating rice and beans. Haha. I hear ya. When we get the little boogers, we don’t take into account how emotionally attached and in love we’ll become with them. They’ve got us wrapped around their fingers… er, paws! She knows when to put on her best face (and then proceeds to wreak havoc when the camera’s off!). Sorry to hear about your little fluffball. Our friends had a cat with the same condition. Health problems and death of pets has always hit me super super hard. I always tell myself I won’t get another pet after one passes away, and yet, I always get another. hi guys! Just discovered your site from a friend and am loving it so far (great distraction at work hehe) . I’m a dog-person, so I have the added expense of training as well – while some owners can train their dogs just fine, that wasn’t our case. We have a super stubborn, but extremely smart, pup so we needed some expert help which was major $$$. Luckily (knock wood), we haven’t had any emergency vet visits this year, other than the preventative care, which was still $190! I don’t know if cat training is a thing (I’m sure it is somewhere) but I wish we had done that with Persie. We probably would have saved some money on trashed furniture. Still love her. Most of the time. Cat training is a thing–a friend of mine is an animal behaviorist who works primarily with dogs; however, lately she has also taken on cat clients. I think she said that it just moves a bit slower, but the cats catch on with positive reinforcement. This. is. awesome! Thanks for the heads up. I just discovered your site today Just wanted to let you know the scratching gets much better if you start off putting a scratching post everywhere they want to scratch, and even better if you get an aircanister with a sensor that blows a puff of air at the kitty when it goes somewhere it shouldn’t. I made scratchers using sissal rope bought at Home Depot for about $5 and carpet squares (think kindergarten circle time style carpets for a few dollars)- MUCH cheaper than buying scratchers and the cats choose them over many of the store-bought scratchers. I made a cat “tower” out of a ladder style bookcase off craigslist, which the cats could climb up and survey their kingdom, keeping them off places they shouldn’t be and used to break things (ie counters, tables, etc). Glad you stopped by! We’ve done the sissal rope before. But we’ve never tried carpet squares. Our cat loves pulling up on the bedroom carpet anyway, so that sounds like a perfect remedy. Thanks for the tips, Heidi! That’s what *I* was going to say! I was guessing, when I read about all the destruction, that perhaps they didn’t have any scratching posts of cat towers. What a difference it makes! Cats NEEEED to scratch things, such as they do when outside, like trees. Not only do they keeps their claws in shape (shucking the old claw outsides when they are ready to go,) but they provide the cat with very important exercise for it’s back and legs, keeping it strong and feeling good. So ya’ll reading about you cat can help you and your cat be so much happier! “Think Like a Cat” has information about training your cat, too. Using food and a clicker. Sounds…a little overwhelming to ME! Well, It’s 2015 now, and I hope you have your house and your dog by now! Agreed… having scratching posts is super important. I hope you enjoy your new cat! We sure love ours! I completely understand where you are coming from. We have had two cats for years, and they didn’t really have much expense to them except for their pricey, special formula bag of food once a month, litter which we buy from Costco, and “insurance” to cover medical. They don’t like treats, and toys lasted for years, and could be re-used after a refresh in the catnip bag. Then we got a dog. Besides what we paid her breeder for her, the monthly cost is staggering. She’s a diva and won’t eat dry food, so her good is prepared fresh by her slaves (us) every two weeks, and is composed of browned, ground turkey, brown rice, shredded raw carrots, sweet potatoes, zucchini and peas mixed with garlic for natural flea fighting and unsalted chicken broth portioned into small bags, then warmed twice per day, and served with a dollop of cottage cheese. Then there’s all the treats and toys and clothes that my frugal husband buys ’cause she’s “adorable” and needs these things. I swear the dog eats better than we do, and gets new clothes more often to boot. And neither of us would change it for the world because we’re wrapped around her furry, little paw, and she makes our world a better place. WOAH! Seriously, that diet is better than mine! Do you guys have room for an extra “dog”? That certainly gives a little perspective to any complaints we’ve had about costs with our cat. They’re actually quite self-sufficient, which helps in that department. I came across your site, and found it very helpful. I am looking to soon move out on my own, and adopt 2 cats I have had my eye on for a while. I used to work at an animal shelter and they are still there. They are on special diet for food allergies and one has a heart murmur. Thanks for the estimate of how much it will cost, it really gave me a good idea for my budget! P.S. Your cat is adorable! Congrats on all the excitement on the horizon! I’m sure you’ve got a good idea on some of those other health costs associated with your soon-to-be kitties, but it’s great to think ahead and know what you’re signing up for. Are you interested in pets,are in search of one,then contact me on [email protected] and send the details of the type of pet you need then we’ll make you a more affordable price. Thank you for this! I’m currently a student but am considering getting a cat. A good friend of mine’s cat just had kittens and I’m trying to decide if I will take one, seeing as I will be moving out of my parent’s house next year and . It really feels right even though half the people I know tell me I’m crazy and the other half says I’m allowed to do what I want with my life. 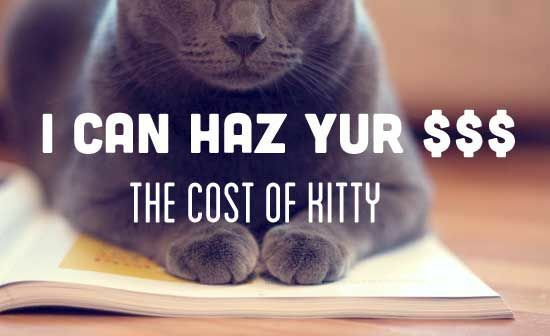 This budget really helped me mentally calculate how I could manage having a cat as a student. I’m really hoping it works out all right. I just convinced my parents to get me a kitten, I better not tell them the budget….. The kitten I’m getting is a white male Persian. Oh my goodness what a cutie! I am thinking about getting a kitten and what I mean by that is that by next week tuesday I will most likely have one! Not sure if it will be a young kitten or a grown cat. any advice? I’m a huge animal person and haven’t gotten one yet because I have to tell myself I can’t afford them. I’m now on my way to the shelter because I can afford to get one….or five. ~Crazy cat lady in training.